Please excuse our appearance while we complete building our site! Thank you for visiting Astoria Dog Owners Association’s website. We have been so impressed by all the community support we are receiving, and are currently working hard to ensure Astoria gets a new dog run. We are presently preparing for the participatory budgeting process and collecting signatures on our petition to provide evidence of the community demand. 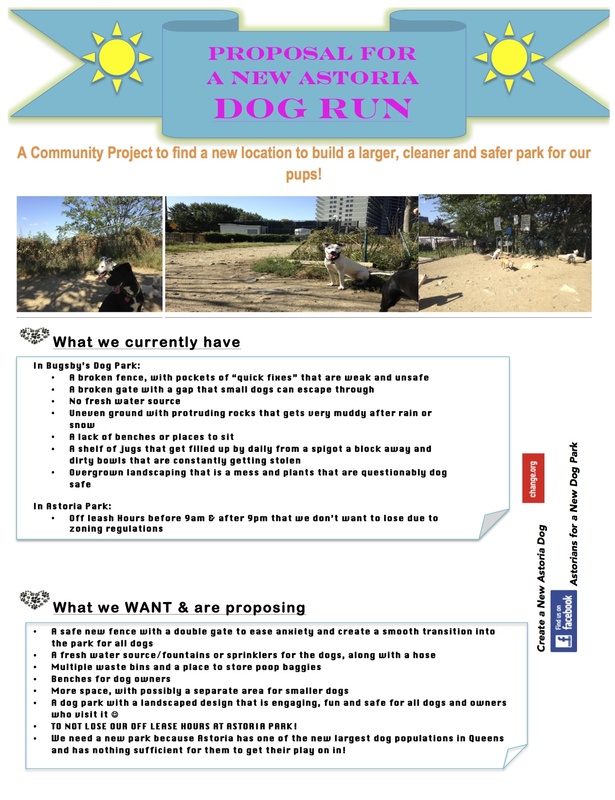 We maintain a Facebook group, Astorians for a New Dog Park, to aid in the planning process, and always welcome input from the community (feel free to join our community). The status of our efforts is constantly changing, so please check back frequently for the latest news! To learn more about ADOA, and our efforts, please use our menu to navigate our page.